The York Legacy dumbbells feature 33mm steel handles that are fully knurled for a perfect grip and hydraulically pressed to create a fish tail handle end. 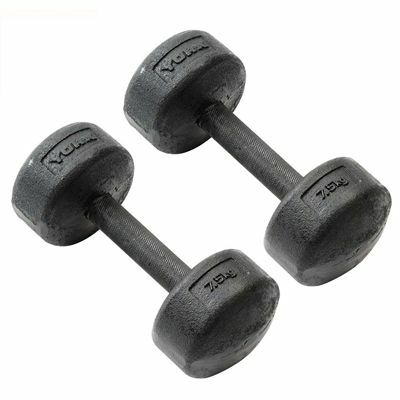 These high quality dumbbells are great for toning the muscles, gaining more strength and improving the overall fitness. They weigh 7.5kg (16.5lbs) and are supplied as a pair. for submitting product information about York 2 x 7.5kg Legacy Dumbbells We aim to answer all questions within 2-3 days. for submitting product information about York 2 x 7.5kg Legacy Dumbbells. We aim to answer all questions within 2-3 days. If you provided your name and email address, we will email you as soon as the answer is published. for submitting product review about York 2 x 7.5kg Legacy Dumbbells.